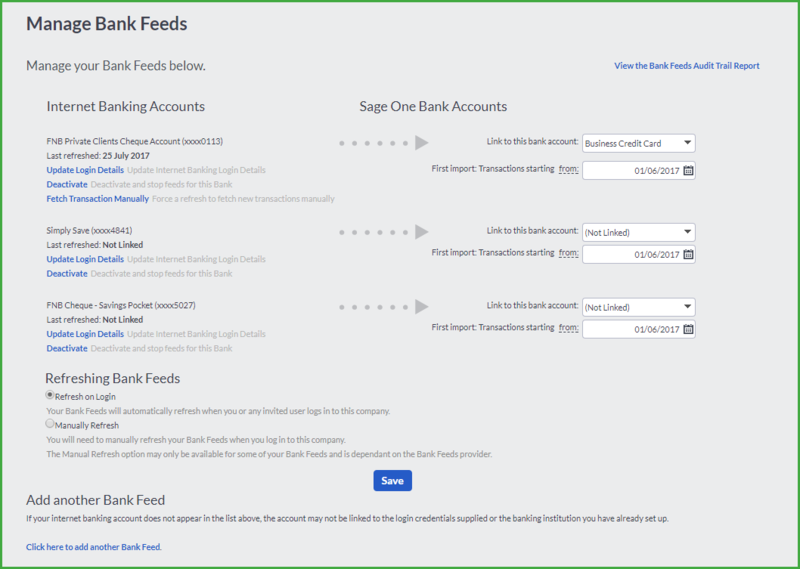 Starting today, you can set up bank feeds which allow you to automatically import bank statements into your Accounting bank or credit card accounts from banks and other financial institutions. This saves you having to manually import your bank statements yourself. Each day when you log into your company, any new transactions available in your bank statement will be automatically refreshed and then made available for review in the Bank Statements screen. You will save even more time by mapping transactions where Accounting will automatically assign the correct accounts each time your automated bank statements are refreshed. Managing your bank account could not be easier! Accounting uses Yodlee, a third-party online banking solution provider. Yodlee connects to thousands of banking websites worldwide to retrieve bank statement information and make this available for use. Yodlee accesses your online banking and stores the login credentials you provide when setting up the bank feed. Yodlee logs into your online banking website on your behalf and retrieves your bank statement information. Yodlee stores your online banking login credentials in a highly secure system. To be able to access your online banking website, Yodlee needs to store a copy of your online banking credentials. You will need to provide these credentials when you set up a Yodlee bank feed in Accounting. Yodlee then logs into your banking website on your behalf and retrieves your bank statement information. This bank statement information is securely transferred to Accounting. If your online banking website is set up to send you an email or SMS notification that you have logged on to your internet banking account, you will also receive a notification each time Yodlee accesses and retrieves your bank statement information. Bank feeds are automatically refreshed every time a user logs into their company, if your bank does not have multi-factor authentication. Transactions brought into Accounting from your bank feeds should be as up to date as your online banking, but may be a few days behind, particularly for credit card accounts. Accounting is reliant on Yodlee to get bank statement information from your online banking account. Delays may occur if the Yodlee site or your online banking site is not working correctly. Yodlee relies on the information from a bank’s website not changing. If your bank changes data significantly, it may affect the accuracy and reliability of your bank feed. Yodlee does, however, do its best to accommodate changes as quickly as possible. Can I deactivate a bank feed? You can deactivate any bank feed from the Manage Bank Feeds on the Banking menu. Can I refresh my bank feeds manually? You can refresh the feed manually at any time. You do this from any of the Dashboard widgets, or Manage Bank Feeds on the Banking menu. Some online banking websites have additional one-time authentication, over and above user credentials, before you can access their websites. This is called multi-factor authentication, and may take the form of a security email or SMS or a security token provided by the banking institution. If you have been manually importing or capturing your transactions, check the date of the last transactions. This is so you don’t import duplicate transactions when you get to the option of importing transactions through the automated bank feeds. If you have already been manually importing or capturing your transactions in Accounting, check the date of your last transactions and start your bank feeds only from the next date. This is so you don’t import duplicate transactions. You can import up to 90 days’ transactions into Accounting. This is however, dependent on your bank as all banks are different. If you need to import more transactions than your bank or Accounting allows through bank feeds, you can manually import these transactions. You cannot import duplicate transactions through bank feeds. Accounting will recognize these transactions and only import any new ones. However, make sure that you do not import older transactions through bank feeds and then import the same transactions manually because Accounting will not recognize these transactions as duplicates. 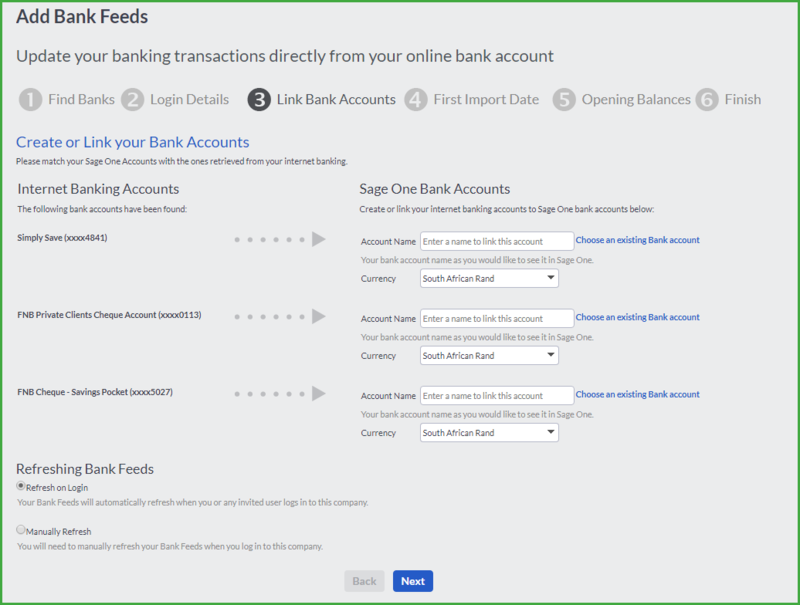 To set up your bank feeds, go to Banking…Transactions…Manage Bank Feeds. Accounting supports thousands of banking institutions. Select your bank from the list or search for your bank using the Other option. Once the bank feeds are enabled, you will be able to select which internet banking accounts from “YOUR BANK” should be linked. 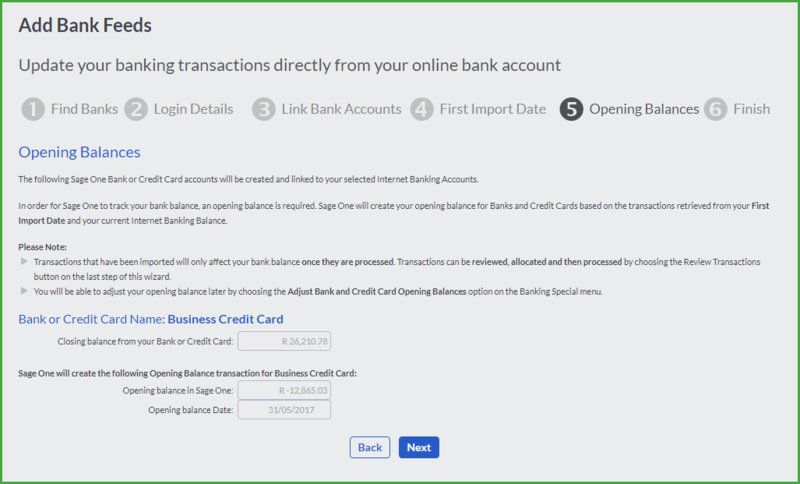 For example, if you have a credit card and a current account linked to one internet banking login, you will be able to specify which bank account to link to your Accounting bank account. With your permission, Accounting will connect to your bank to enable bank feeds. To do this please provide your internet banking login details. Enter your account names or choose and existing bank account. Select the date from when the transactions must be imported. The Accounting Bank or Credit Card accounts will be created and linked to your selected Internet Banking Accounts. In order for Accounting to track your bank balance, an opening balance is required. Accounting will create your opening balance for Banks and Credit Cards based on the transactions retrieved from your First Import Date and your current Internet Banking Balance. Transactions that have been imported will only affect your bank balance once they are processed. Transactions can be reviewed, allocated and then processed by choosing the Review Transactions button on the last step of this wizard. You will be able to adjust your opening balance later by choosing the Adjust Bank and Credit Card Opening Balances option on the Banking Special menu. 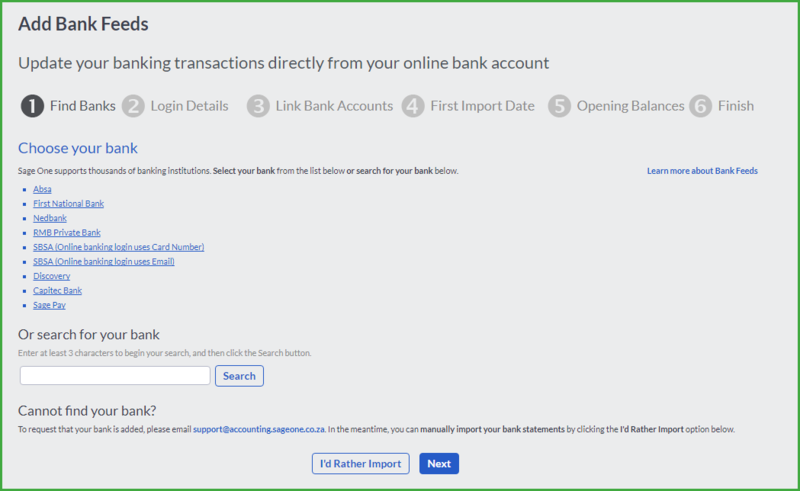 Once the account is linked, click on the Review Transactions button to view the transactions in the Bank Statements screen. 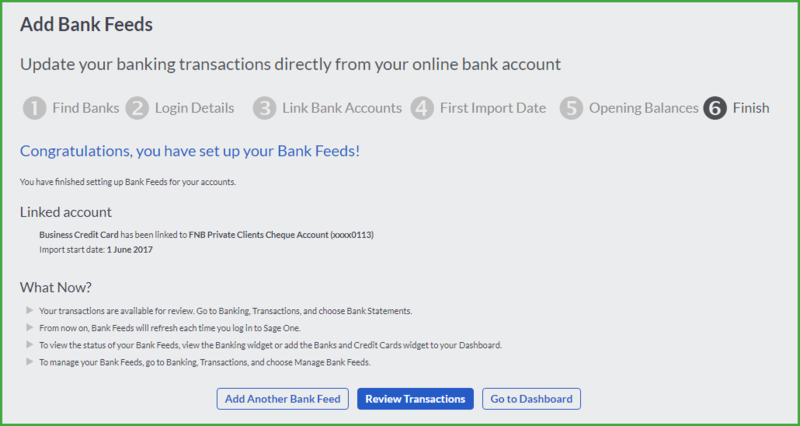 To manage your bank feeds, go to Banking…Transactions…Manage Bank Feeds. Accounting allows you to change your current bank account which is linked to a bank feed to another bank account. In the Link to this bank account drop down menu, select the bank account you wish to change to. Enter the date that the system needs to start importing the bank accounts from, in the First import field. Once the new selection has been made, click on the Save button. You can deactivate your bank account from using the bank feeds feature in Accounting. 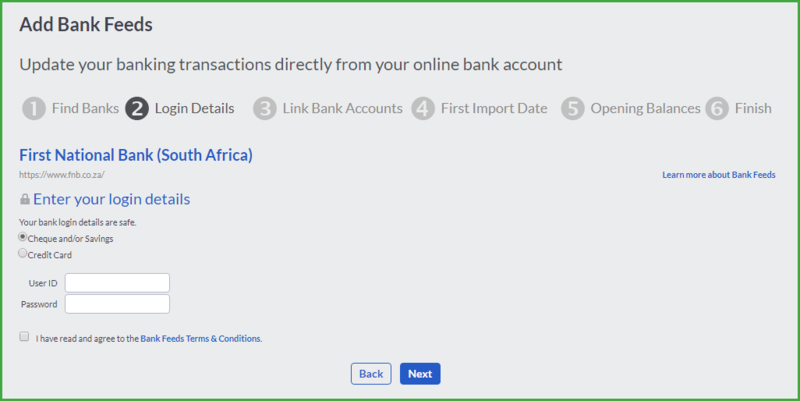 When you do this, you will only have the option to import your bank statement transactions manually. Click on the Deactivate link to deactivate your account and to import your bank statements manually. Confirm to deactivate your bank feed. When you have changed your internet banking login details, you have to change the details in Accounting to prevent errors from happening. Only with your permission, Accounting will connect to your bank to enable bank feeds. To do this, you need to provide your internet banking login details. Click on the Save button to update the changes. If your internet banking account does not appear in the list of bank accounts, the account may not be linked to the login credentials supplied or the banking institution you have already set up. To create a new or add another bank feed, click on the here link at the bottom of the screen. You may encounter errors when the Bank Feeds are running. Your login details may be incorrect. Change your bank feeds login if you have changed your Internet banking credentials with your bank, but haven’t updated them in Accounting. Go to Banking…Transactions…Manage Bank Feeds. Yodlee is unable to connect to your Internet banking site. Check that you can access your Internet banking site from the bank website. There is a problem getting transactions from Yodlee. Refresh your bank feeds manually. If you still encounter an error, contact Accounting support.